Demand the Original, Demand the Best, Demand Safely Ride! There's no better way to get your little one enjoying their new ride than with Safely Ride training wheels. 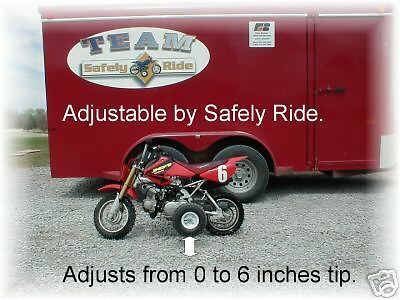 Safely Ride Manufacturing is a family owned and operated business. What that means for you is... we have a personal investment in every set of wheels that leaves our shop. Our number one priority is your child's safety and we will not take any short cuts in the manufacturing of our wheels. We strive to build a high quality product at an affordable price. We want every child to have the opportunity of learning to ride in the safest manner possible. We also strive to provide the best customer service in the industry. We will be here for you year round and not just when the market is good. We stand behind our products 100% and should there be an issue, we will take care of you. When you call you will be assisted by one of the family to ensure you get the highest level of service possible. Before we were known as Safely Ride we were a family with young riders of our own. In wanting to reduce their chances of getting hurt while learning to ride, we designed our very first set of wheels for the Yamaha PW50. This was well before everyone had a personal computer and was selling on the internet. We ended up manufacturing a few sets for friends and family, but never did much with it until we heard of ebay in the mid to late nineties. The rest of the story is pretty much history. In 2000 we expanded to the Honda, Suzuki, Kawasaki and so on. Our training wheels are proudly manufactured in the USA. Thank you for your interest in Safely Ride Training Wheels. We are here to assist you and answer any questions you have. You can email us at salesandsupport@safelyride.com or call us Monday - Friday 8:00 a.m. to 5:30 p.m. central standard time...620-867-2341. Thank you again and we look forward to serving you!